Although it was a Tuesday to forget for the Flyers, who fell to the Tampa Bay Lightning, there was something that should make the Philly faithful smile. At some point during the Washington Capitals – Montreal Canadiens game, Capitals’ captain Alex Ovechkin hip checks Canadiens’ rookie PK Subban in the open ice. Subban flies up in the air and almost lands directly on his head. The rookie then went after Ovechkin, only to receive a penalty. Earlier in the season, Flyers’ captain Mike Richards prognosticated that Subban would eventually receive his on-ice punishment for running his mouth in excess as a rookie. After missing Sunday’s game against the Chicago Blackhawks with a slight groin pull, Flyers winger James van Riemsdyk practiced on Monday but will likely remain out for Tuesday’s home contest against the Montreal Canadiens, general manager Paul Holmgren told the Philadelphia Inquirer. Dan Carcillo, who missed Monday’s practice for personal reasons, is expected to remain activated in JVR’s spot. 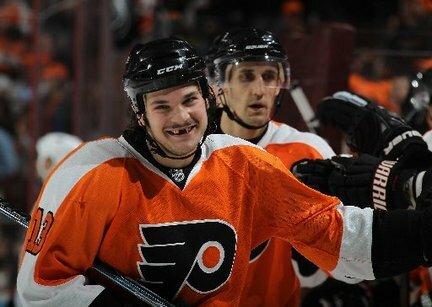 Carcillo has two goals and one assist in just 27 games this season. JVR’s injury was not deemed serious. However, with just one game in the next seven days, thanks to the NHL All-Star break, receiving maximum healing time, while also giving Carcillo an opportunity to contribute, was likely the reason for holding JVR out of the lineup. JVR has 12 goals and 11 assists in 44 games this season. Montreal’s G-Halak to the St. Louis Blues for Eller, Schultz. In a move seemingly out of left field, RDS is reporting that the rights to Montreal goaltender Jaroslav Halak has been traded to the St. Louis Blues for 21-year-old center Lars Eller and forward prospect Ian Schultz.